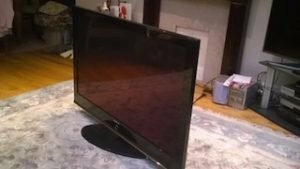 House Clearance Service In All Areas Canonbie Longtown Brampton Silloth Alston Wigton Thursby Maryport Bothel Cockermouth. I wonder if you could give me a quote on a small clearance – 1- double bed – 1 single bed – dressing table – tallboy – small single bed chesterfield – two seater parlour settee – 4 arm chairs (small) – drop leaf table – 2 kitchen chairs – three small tables – and wardrobe (in pieces) The house is in Cockermouth and if we accept the quote the items would have to be moved this month. Thank you. A brand new boxed red and stainless steel, KitchenAid 3.3L mini stand mixer. 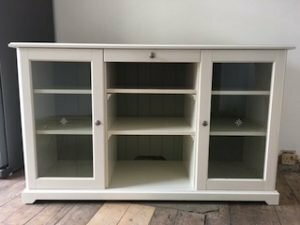 A white solid wood television unit, have a glass inlaid cupboard to either side of two central shelves and a small drawer. 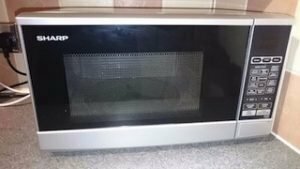 A black and silver Sharp 20L microwave oven. 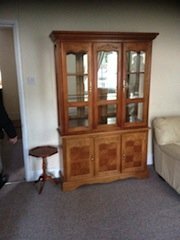 A tall standing solid wood and glass, mirror backed display unit, having two doors opening to reveal four glass shelves, above a double and single cupboard, with brass mounts. 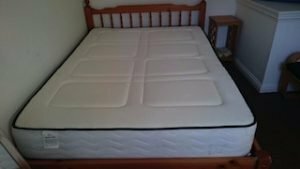 A solid pine double bed frame and white double mattress, together with a small pine bedside table. 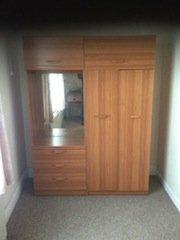 A large two piece solid pine quadruple wardrobe, having two storage shelves above a double wardrobe and three drawers, inlaid with a vanity mirror to the left side. 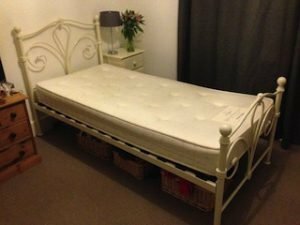 A cream metal 3ft single bed frame and matching single mattress, together with two chests of drawers. 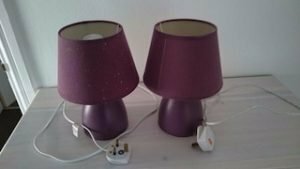 A pair of ceramic purple bedside table lamps, with matching fabricated purple lampshades. 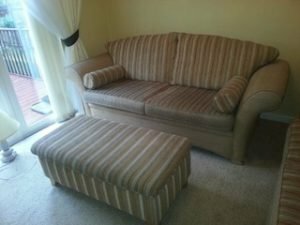 A two seater sofa and matching rectangular storage table, upholstered in striped patterned cream fabric, and on pine splayed legs. 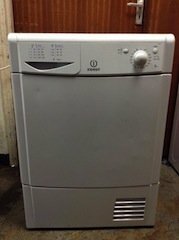 A white under counter Indesit 8kg condenser tumble dryer. 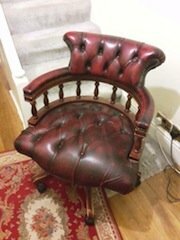 A vintage Chesterfield style, mahogany framed desk chair on castors, upholstered in ox blood red authentic leather with button detailing. 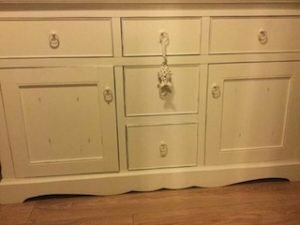 A hand painted cream, solid wood shabby chic sideboard, having three drawers above two cupboards and two central drawers. 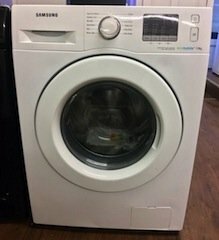 A white under counter Samsung Eco bubble 7kg, 1400 spin washing machine. 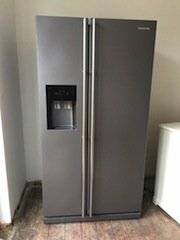 A collection of metallic red kitchen accessories, to include a Russell Hobbs kettle, a four slice matching toaster, a large bread bin and tea, coffee and sugar canisters.